The Book Rat: CLOSED Giveaway: Jane Austen Omnibus from Edie! 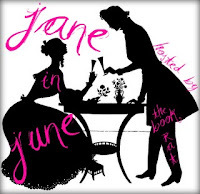 A lot of people have offered a lot of great things for me to give you during Jane in June, and as I was sorting through them and deciding what would go where, I figured what better way to kick of Jane in June than to offer up all of the novels of Jane Austen. Few novelists have conveyed the subtleties and nuances of their own social milieu with the wit and insight of Jane Austen. Here in one volume are her seven great novels: Sense and Sensibility, Pride and Prejudice, Mansfield Park, Emma, Northanger Abbey, Persuasion, and Lady Susan. Through her vivacious and spirited heroines and their circle, Austen vividly portrays English middle-class life as the eighteenth century came to a close and the nineteenth century began. Each of the novels is a love story and a story about marriage—marriage for love, for financial security, for social status. But they are not romances; ironic, comic, and wise, they are masterly evocations of the society Jane Austen observed. This beautiful volume covers the literary career of one of England’s finest prose stylists of any century. That's it. Plain and simple. Though I'd love to know in the comments if you've read anything by Jane before, and if so, what. Deckle edge? I'm so there! This looks beautiful. I've read all of Austen's novels except Emma, just bought her letters, and I'm still working my way through her juvenilia. Let's see...I've read Sense and Sensibility, Northanger Abbey, Mansfield Park, and Pride and Prejudice, in that order. I also have Persuasion buried on my shelves somewhere. Northanger Abbey was my favorite because of its satirical gothic nature, but I think Sense and Sensibility is the best-written. This sounds awesome!!! I still have quite a few Austen books that I want to read! I will pathetically admit that I have only read Pride & Prejudice. The rest are on my to-read list, so all the better! I just finished reading Pride and Prejudice at the beginning of May. Just as dreamy as I knew it would be! I was going to link my review up in your linky...once it's written, that is! I read Sense and Sensibility last year and loved it as well. What's not to love about Jane?! This is a great give-a-way! I love all things Jane Austen. Sense & Sensibility has to be my favorite. Wish that Colonel Brandon were real! I adore Jane Austen! Love!! Thank you so much for this great giveaway! Amazing giveaway! Persuasion is my favorite Austen novel, followed by S&S, I think. Or maybe NA -- I can't decide! What a beautiful book! I have read all of Jane's books but Northanger Abbey and Mansfield Park! The only books of hers, that I haven't read are Northanger Abby and Mansfield Park. P&P is my favorite. I plan to read Mansfield Park & Northanger Abbey this summer, then I'll have read everything :o) Well, gotta get/read the Juvenalia, but the major works, I'll have covered. Love 'em!! !